Did you know you can book your hotels on line through TheLocalHB? What an easy way to save anywhere from 20% to 50% at Huntington Beach hotels. To read about the available hotels, check rates and book your stay, CLICK HERE. If you are not comfortable booking on-line, you can call our toll free number: 1-877-545-3249 and speak to an expert. 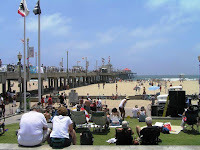 Come to Huntington Beach to visit. Check out all there is to do in town! A nice day at the Pier. This Blog has mentioned what Slow Food is all about. Now here is your chance to try it out for yourself. On Monday, September 10 - 4:30 pm there will be a Business Ribbon Cutting at Slow Fish Cal-Korean cusine - 16051 Edinger Ave. Stop by and enjoy the delectable sushi, the fresh local fish and seafood at this charming casual cafe situated in in the heart of Huntington Beach. Dishes are designed and prepared to be savored leisurely in honor of the Slow Food Movement. Enjoy sake pairing dinners, a prixe fixe menu or express lunch. Don't forget to try the Fat-Avo, an "apple" of seared albacore covered in avacado slices - one of their signature dishes. Read more details about the restaurant HERE.